I had plans for a simple and healthy steamed tofu recipe, but while discussing food with my fellow law clerks at some point during the day, I began to crave macaroni and cheese. 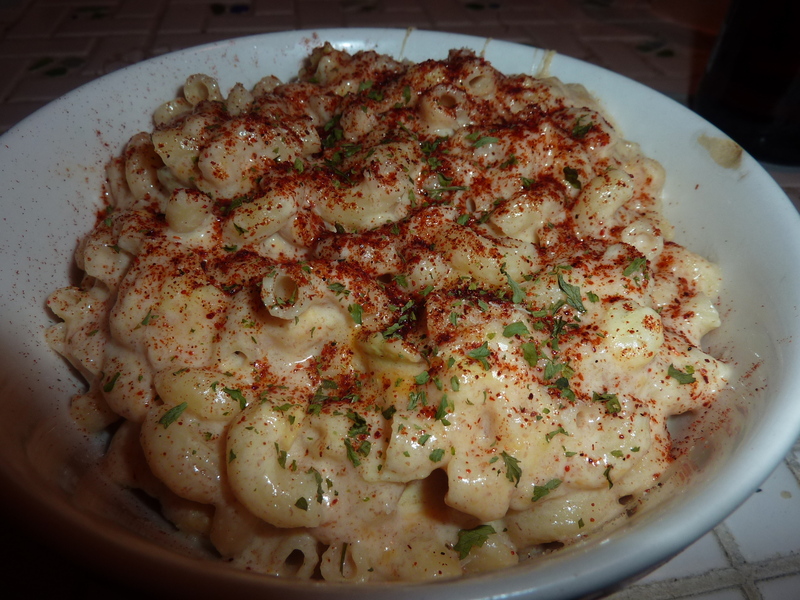 And not just any mac and cheese, but a clog-your-arteries buttery and creamy mac and cheese, made with real butter, milk, and tons of cheese. But I didn’t want to use the oven, because it was like 90 degrees out. So I decided to do a stovetop version. And, boy, was this good. Creamy cheddar, sharp Parmesan, and tangy goat cheese combined with the unique flavor of artichoke hearts made for a seriously decadent macaroni and cheese. Is it a quintessentially summer dish? Hell to the no. 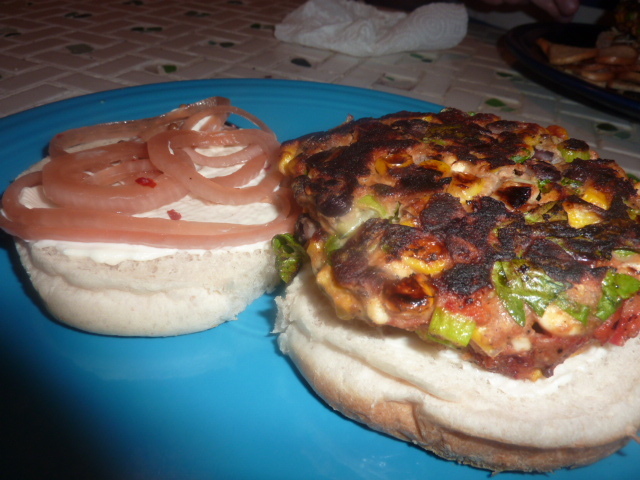 But it tasted really, really effing good. It also reheated well in the microwave for lunch, which is a big bonus when you make enough mac and cheese to feed five people in a house of two. Cook macaroni according to package instructions. Let drain. Melt butter in a large sauté pan over medium heat. Once it just begins to froth, whisk in the flour in small batches until smooth. Slowly add the milk, continuously whisking. Working in small batches, add the cheese. Taste for seasonings and add salt and pepper to taste. Add the cooked noodles and artichokes and stir to combine. Stir and cook over medium heat until both noodles and artichokes are heated through. Serve immediately topped with chili powder and dried parsley. I loved the pickled red onions I made by adapting Michael Symon’s recipe so much that when I saw some pickling cucumbers for sale at our usual grocery store, I knew I had to buy them and see if it worked on them as well. I decided to make an additional change to the original recipe by adding some roughly chopped fresh ginger, which I though would work well with the flavor of the coriander. I also played around a little with the spice amounts a bit. This recipe worked really, really well. The flavors were addictive and interesting – a nice hint of sweetness at the beginning of each bite, transitioning into a punch of salt, the aromatic coriander and mustard, and the spice of the ginger and crushed red pepper flakes that lingers on your palate. The texture of the pickle is crunchy and crisp. These would be delicious alongside any sandwich but are also pretty darn good on their own. 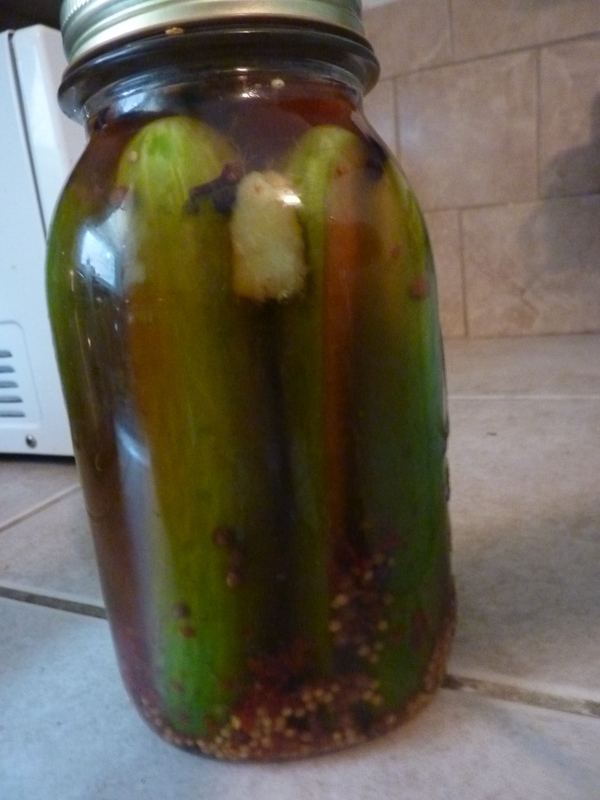 Pack the cucumber slices in a 1-quart jar and cover with water to come within 1/2″ of the rim. Pour the water out into a measuring cup. Note the volume, then pour off half of the water. Replace it with half apple cider vinegar and half rice wine vinegar. Pour the vinegar mixture into a nonreactive saucepan. Add 2 tbs. sugar and 2 tbs. salt for every 3 cups of liquid. Add the mustard seeds, red pepper flakes, coriander seeds, black peppercorns, garlic, and bay leaves. Bring to a boil over high heat. Allow the liquid to boil for 2 minutes, then remove from heat. Pour the hot liquid into the jar over the onions. Stir to evenly distribute the spices. Screw on the lids and shake a few times. Let cool to room temperature. Transfer to refrigerator. Refrigerate for up to 1 month. It’s finally really and truly heated up around here, so I was looking for an entrée that didn’t require the oven or a whole lot of stove top simmering. This meal came together in a matter of minutes and was deeply satisfying. The mushrooms added a nice meaty bite to this meal. 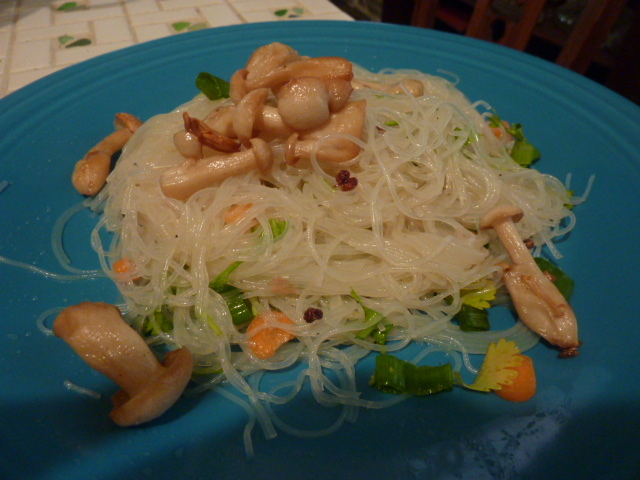 The vermicelli noodles had a nice springy texture and were brightly flavored with ponzu, vinegar, and lime. This meal also makes for excellent leftovers. Soak vermicelli noodles in hot water for 3-5 minutes, or prepare according to package instructions. Run under cold water until chilled. Toss together all ingredients except the mushrooms. Serve mushrooms over the noodles. Whisk together, or put into a closed container and shake, until well combined. In a cast iron pan, heat oil with seeds and peppercorns over medium-high heat. Add mushrooms and cook, turning frequently, until golden brown. Drain for a few minutes on a paper towel and serve over noodles. This wasn’t a planned post, but once I took the first bite of this dish, I knew it was worth sharing. 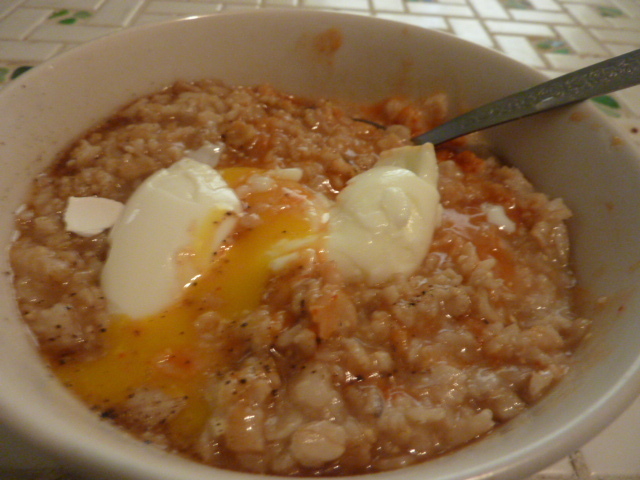 This savory oatmeal is comprised of an Asian flavor profile, amped up a notch with a kick of spice from the sriracha. It was well balanced by the creamy soft boiled egg. This would look much prettier and be pretty darn tasty with a garnish of scallions, but after that first bite, I wanted to dig right in rather than gussy this up. Bring a pot of water deep enough to cover the egg by about 1″ to a rolling boil. Add egg straight from the refrigerator. Cover pot and remove from heat. Let sit seven minutes. Meanwhile, prepare an ice bath. Bring chicken stock to a boil in a medium saucepan. Add oatmeal and cook, stirring frequently, 4-5 minutes. Once cooked, keep covered and warm over very low heat. Once seven minutes have passed, carefully transfer the egg to an ice bath. Let sit about a minute, and then peel under running water. Mix together oatmeal, butter, sriracha, soy sauce, shaohsing rice wine, sesame oil, and black pepper. Top oatmeal with boiled egg.